At Medaesthetics® we are continually looking for new, yet safe and effective ways to help our patients look and feel better about themselves. One of these new ways is the world first CoolSculpting® procedure by Zeltiq™! A revolutionary method to freeze the excess fat to oblivion! Without any surgery and minimal downtime. At Medaesthetics®, Coolsculpting procedure is performed by our fully qualified clinical staff. 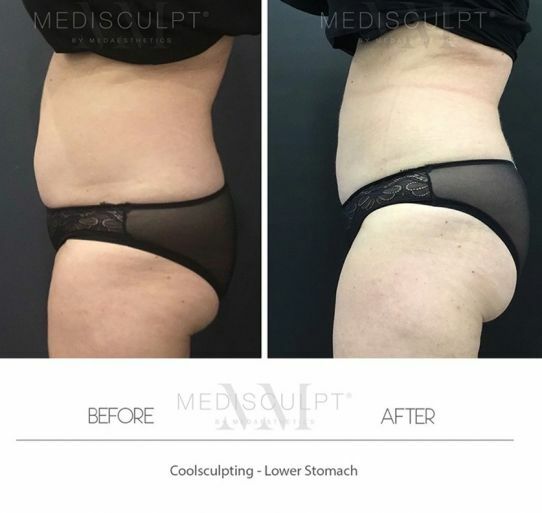 We are one of the very few clinics in Australia to offer both surgical (Vaser liposuction) and non-surgical (CoolSculpting™, Sculpsure™ Velashape III) options under one roof. Important Note: It is essential to understand that not all Coolsculpting devices are the same. Only the latest version of Zeltiq™ Coolsculpting® platform is capable of delivering the superior results patients want. Older models of this platform which most clinic’s in Perth seem to have, are just not powerful enough to provide the maximum results. Patients are advised to choose the clinic which offers the latest applicators and treatment protocols performed by medical staff. 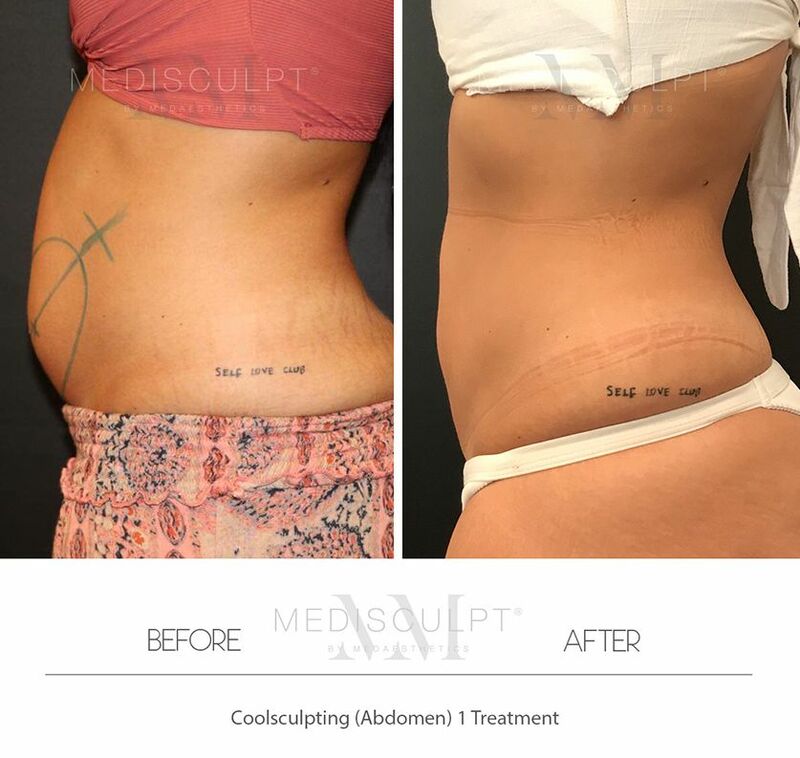 At Medaesthetics™ we often combine Coolsculpting with Velashape III™ Cellulite Reduction and Sculpsure™ Laser Fat reduction to deliver superior clinical results. CoolSculpting by Zeltiq™ is essentially a form of body sculpting. It aims to eliminate unwanted body fat and tone up the problem areas which do not respond to exercise and diet. It is the only non-invasive and non-surgical procedure to clinically eliminate excess body fat with close to 100% patient satisfaction rate. Following animated video, explains how this procedure works. The CoolSculpting applicator is applied on the body area you want to target. Cold air is then, in a controlled manner, released. This causes the fat cells to freeze, crystallize and eventually, die off. The cells are then removed permanently and naturally from your body’s immune system. This procedure in itself is one of the most successful fat reduction treatments that gently, yet effectively remove fat without any pain and downtime. CoolSculpting can be used anywhere on the body but is typically used for targeting excess fat around the abdomen, love handles, backs, stomachs, thighs and arms. Coolsculpt Mini™ is the latest applicator recently released by Zeltiq™ which targets chin fat (double chin) and armpit fat (underarm bulge). Absolutely! Coolsculpting is the safest form of fat reduction procedure available in the market that actually delivers visible results. There are one or two very rare (temporary and mild) potential risks associated with Coolsculpting mentioned in the literature. This includes temporary discomfort in the treated area and rebound hyperplasia.We can talk about this in detail during your consolation. The procedure itself is painless. There is mild to moderate discomfort which some patients may experience that lasts for 2,3 days afterwards. However, it is a non-invasive and non-surgical procedure that generally requires no pain relief, anaesthesia or downtime. We will help you create an individualised treatment plan to your specific goals. Typically, one session lasts 60 minutes, however, this could vary depending on the number of areas being treated during the visit. We may schedule additional sessions in order to meet your goals. Once the treated fat cells are crystallised (frozen), your body processes the fat and eliminates these dead cells. Once the treated fat cells are gone, they’re gone for good. There is literally no downtime associated with this procedure. Patients can expect to resume normal activities immediately after the treatment in majority of cases. Most patients can expect to see a 20-35% loss of fat after a single session. This number will continue to increase after 2-3 months, without any additional treatments. However, if clients want to see enhanced results, more sessions can be added. Am I a viable CoolSculpting candidate? Coolsculpting® is the ideal procedure for anyone wishing to get rid of excess body fat but not keen to undergo traditional liposuction surgery. If you have a stubborn fat, then you may be a good candidate for the treatment. CoolSculpting is not intended for use with grossly overweight patients. Ideal candidates are those who need just a few problem areas toned up. Dual-sculpting is the term used when not one but 2 Coolsculpting Machines are used side by side to apply 2 applicators simultaneously to reduce the treatment time by less than half. Only a handful of clinic’s in Australia offer Dual-sculpting™. This depends upon the body areas being treated and the number of Coolsculpting cycles being used. Prices start from $699 per Cycle (unless we are running a special promotion). A ‘cycle’ is determined by the number of times the CoolSculpting applicator is placed on the skin to cover a pocket of fat (presented by the colour ellipses below). Depending on the size/volume of fat present, more than 1 cycle may be required to reduce the fat to achieve the desired result. 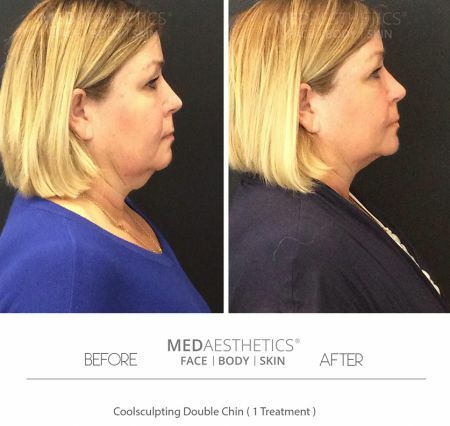 Why choose Medaesthetics in Perth for your one-stop CoolSculpting procedure? We are one of the handful of clinics in Australia to offer both Surgical (Liposuction) and Non Surgical (Coolsculpting) options for fat reduction under one roof. One of the biggest concern people have about Non Surgical fat reduction is that ” would it really work! ?”At Medaesthetics®, we offer a fat reduction guarantee after your coolsculpting procedure. If it didn’t work after the recommended number of cycles are done and we felt you could loose more fat; we will offer you traditional liposuction (provided you are a suitable candidate) at 50% discount.